Tim Cook's Apple is still breaking records. DOOOOM! "This can only mean one thing," I said to myself. "Apple is DOOOOOOMED!" Well, it's about as scientific as any other "Apple is DOOOOOOMED!" analysis. Instead of facts and figures, Apple could have released nothing but a picture of a small dog during yesterday's earnings call and we'd have endless reports explaining that the dog was smaller than Wall Street expected, and that the diminutive dog doodle proves that Apple is DOOOOOMED! Here's the short version: No. Here's the long version: Nnnnnnnnnnnnnnno. Revenues are up. iPhone sales are up. iPad sales are up. iTunes sales are up. Yes, Mac sales are down very slightly, but they're still doing pretty well compared to the wider PC industry: Horace Dediu estimates that Apple's raking in 45% of the profit in the PC market. What's causing the doom-mongers to break out their widows' weeds isn't that Apple is losing money, or that people aren't buying its products. It's that Apple's profit margins have fallen. Previously Apple's profit margins were WTF*. Now, they're just OMG**. The profit margins are down because Apple's doing exactly what analysts clamoured for: it's making more affordable products such as iPad minis, and it's keeping older iPhones on sale at lower prices. Apple said it was doing that, and it told analysts earlier this year to expect profit margins of between 37.5% and 38.5%. So of course when Apple announced profit margins of 37.5%, analysts went crazy. "Apple is rubbish, and also DOOOOOMED!" they cried. 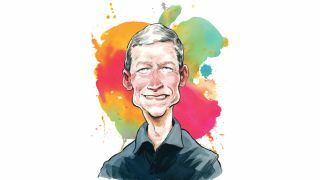 Like stopped clocks the analysts will be right eventually - all empires fall - but predicting Apple's demise based on a single set of financial results is ridiculous, and claiming that Apple doesn't have anything in the pipeline is even more ridiculous. There were six years between the iPod and iPhone. We're supposed to write off Apple because it's been a whole six months since the iPad mini? Then again, we're talking about the same kind of level-headed long-term thinkers who, er, freak out over a single fake tweet. What we're seeing here is the tail end of a wave. The last few years have largely been about the iPhone, its astonishing sales and its incredible profit margins, and now that growth is slowing - just as the iPod's growth slowed before it, and just like the iPad's growth will also slow. When you're the only game in town you only get so long before the competition catches up and the market matures. What's surprising isn't that the iPhone is being squeezed. It's that Apple has been able to maintain such extraordinary profit margins for so long.